We had so much catching up to do since we arrived from Cagayan De Oro City for the holidays. Talk about parties, reunions and stuff, we gladly and willfully attended those as much as we could in the last two weeks that we’ve been back. However, there were times when some potluck gatherings just had me pooping out like anything with all the brainstorming on what to bring on those events. Yes, sure, to buy food can be the easiest and the wisest thing to do, but half of me tells me that it’s still better if you make your potluck share yourself. Why? because 1. it’s more personal 2. the taste is according to your palatal satisfaction 3. cheaper and 4. it’s downright ‘uncommercialized’. There. 4 solid reasons why you shouldn’t buy pansit malabon or mocca roll for your potluck contribution (hee hee). Over at Marra’s two weekends ago, we had our belated barkada Christmas party. I decided to do a fuss-free (well, compared to my other party dishes..) dish. Spicy beef caldereta- it’s a filipino favorite. It’s my personal favorite, too. This version was passed on to me by my mom, whom I hail as the ‘kitchen queenpin’. 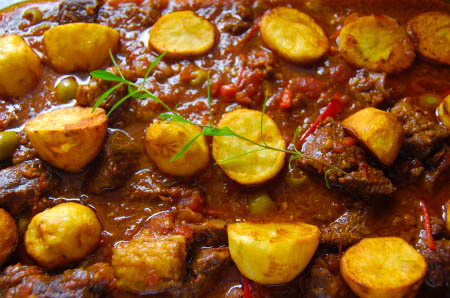 She actually calls this dish adobado and is quite different from the usual way of cooking caldereta as the ingredients are layered, uses minimal canned/foiled tomato sauce and the potatoes are fried. 1. Season beef with salt and pepper then marinate in soy sauce and calamansi for 30 minutes. Set aside. 2. Layer the ingredients in a casserole such that tomato is at the bottom, then marinated beef, garlic and onion at the top of the whole ensemble. This way, flavors lock in the beef that’s in the middle of the assembly. 3. Pour in about 3 cups of water to help liquify and wilt the tomatoes at the bottom. Bring to a moderate simmer. 4. Once drying out, continue pouring in water until beef tenderness is achieved. 5. Add the bell peppers, laurel leaf, sili and the pitted olives. Mix in the tomato sauce. Set aside. 6. Meantime, deep fry the potatoes. I prefer slow-cooking versus using the pressure cooker for this dish. By slow cooking, you are assured to achieve the ‘nagaagaw na tomato sauce and mantika’ effect. I used minimal tomato sauce because you wanna achieve the most natural tasting tomato sauce. hi, tuesday! thanks for the suggestion about searing although, the concept of this caldereta is all about ‘layering’ the ingredients to lock in the beef in the middle. searing might be impossible for now. but yeah, i agree, you may use more tomatoes pa if you wish! thanks for swinging by this page. Hi Caren! 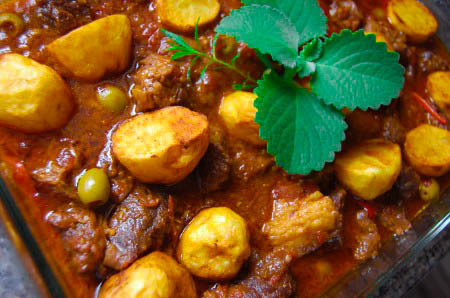 I want to try your spicy caldereta recipe…it looks so yummy. However, I’m a little confused…how did you cook this? In the oven or in a casserole over the stovetop? You only mentioned slow cooking and I’m not sure what kind of slow cooking you meant. Thanks! Hi, Cathee! Sorry for the confusion. We don’t bake caldereta kasi. It’s always in a casserole slowly simmered using a stovetop. Thanks for swinging by my page! hey caren!! 🙂 caldereta is my favorite!! i will definitely try out this recipe!